Growth in the online TV service market may be slowing, but TV brands could help reignite growth in 2019. Growing or not, the services continue to reshape the living room experience. New data from Parks Associates suggests the growth in SVOD penetration in the US has slowed and may have peaked. The company says that just over 60% of survey respondents claim to subscribe to one or more SVOD services. The penetration has not changed much in the last three years. Other data also suggest SVOD penetration growth is slowing, although not quite as fast as Parks is suggesting. TiVo says that between Q2 2016 and 2017 the number of people saying they used SVOD services increased 4.4% to reach over 68%. In the previous year, it increased by over 8%. Parks says it thinks SVOD services are close to saturation point in the US. However, with the entry of major TV players into the direct-to-consumer (DTC) SVOD market, growth could be about to take off again. Disney is busy assembling an arsenal of content to help its 2019 DTC service hit the ground running. Of course, Marvel, Pixar, Disney, and Star Wars brands will be there. Now they will be joined by some of the top Fox brands which Disney has just acquired. For example, film franchises like Ice Age, Avatar, and X-Men should be right at home in the service. With a price point well below Netflix, Disney DTC is sure to get many people to at least check out the service. However, with a brand like Disney pushing it, the service may help bring a good proportion of the third of Americans that have stayed away from SVOD so far. In a recent survey of 205 media executives, 83% said they thought all TV channels would launch a DTC service by 2022. 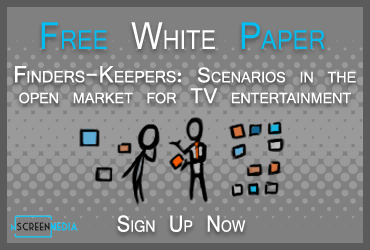 With major television brands entering the market, it could be just the kick the industry needs to drive SVOD penetration past pay TV’s current 77%. Whether SVOD penetration is growing or peaking, there is no doubt the services are changing the people enjoy their entertainment at home. According to Ampere Analysis, 13% of homes in the US say that SVOD is their main form of TV service. AS well, the average SVOD home in the US has 2.8 services. The preferred screen for viewing is increasingly the television. According to the NPD Group, there were 210 million connected TV devices (CTVDs) installed in US homes. That number is expected to increase to 275 million by the end of 2021. NPD also says the mix of connected TV devices people use to watch is changing. Gaming consoles are currently the most popular CTVDs. However, the number of streaming media players and smart TVs installed will outstrip game consoles in 2018. Wi-Fi homes may already have switched away from the game console, according to comScore. It says 47% of W-Fi homes have at least one streaming media player, while only 31% have a game console. SVOD penetration in the US is slowing. The entry of TV brands into the direct-to-consumer SVOD market over the next two years could reignite growth. 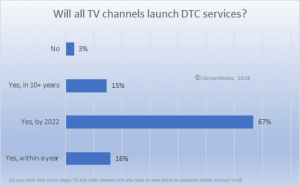 DTC services are changing the devices people use in the home to watch television.